What a brew! A Scottish brew master, his Tunisian wife and two Yanks operate a boutique brewery. They produce several hundred bottles a month and plan more. The Israeli beer industry includes a wide range of brew masters from native Israelis to North American immigrants whose microbreweries can be found across the country from the Golan, Western Galilee and Jezreel Valley, to Ein Hod and Emek Hefer in the north and in the Negev. 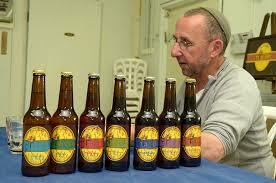 In the hills of Judea, Gush Etzion also has its very own brewery known as the Lone Tree Brewery. Established four years ago by David Shire, originally from Glasgow, Scotland and his wife, Miriam from Tunisia, along with an American couple, Yochanan and Susan Levin, the brewery offers a wide array of flavors to the Israeli market. Most likely the only Scottish brew master in Israel and maybe even in the Middle East, Shire has been living in Israel for the past 30 years. A biologist, who was studying for a PhD when he first made aliyah while working at Hadassah, Shire made a career switch to landscape gardening and eventually discovered the brewery business as well.